BRAND NEW LUXURY CABIN! ***OPENING DECEMBER, 2019*** Sleep 68 people in the luxurious 16 bedroom cabin with Indoor Pool. 16 Individual Suites with kitchenettes and private bathrooms, Movie Theater Room, huge covered porches, video games, pool table and more amenities than we can list! 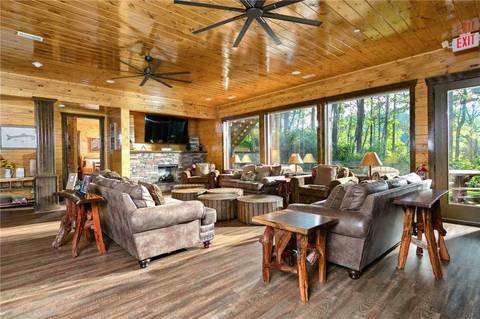 The Wildbriar Lodge is The PREMIER 16 bedroom cabin in the Smoky Mountains! Hurry and get your reservations early, availability won't last! First Floor: Enter into the "Great Hall" at the Wildbriar Lodge. Large Vaulted Ceilings, wide open spaces. Your first thought will simply be.... "WOW!" Fully stocked kitchen, large dining room tables, bar seating, living room with comfortable seating, 2 gas fireplaces and a huge flat Screen TV will greet you as you come through the front door. Just in front of the living room area, an 1,800 square foot covered deck awaits you with its' own 450 square foot outdoor kitchen! Perfect for those outdoor gatherings, all with views of the Great Smoky Mountains! There are 8 individual suites on this floor, each with it's own kitchenette (fridge, microwave and keurig coffee maker.) These suites will allow you to have plenty of private time away from your group. King sized beds, futon couches and private bathrooms will be in each suite. A full sized washer/dryer and laundry room are also on this floor. Sleep up to 32 guests on the main level alone! Downstairs Level: This place just keeps getting better! Amenities like a Theater Room with huge flat screen and surround sound, multiple video arcade games, a pool table and to top it off, a full sized indoor swimming pool will keep your group excited your entire stay! Another 1,400 square foot covered porch with 2 hot tubs for relaxing, all with great mountain views! There are 8 bedrooms on this level. 7 of the bedrooms have King sized beds with futons and private baths. The "Bunk" room has 2 sets of custom made, queen sized bunk beds. AND YES.... ALL OF THESE ROOMS ARE SUITES!!!! Availability will be very limited in this one-of-a-kind luxury cabin. Book now!